Actually, it needs both of those two things. And now that I think about it, it needs most (if not all) of many more things. First of all, the upper body needs greater rigidity. You'll notice that most kids doing the DDR whip their upper bodies back and forth as if their legs and buttocks were in command. Caught up in the fervour of Electro-Instruction but undisciplined, they allow their torsos to incline by submissive degrees. This is heresy. Imagine an army led by its calves and buttocks! A proper Dance Dance Hoplite Revolutionary, raised above the bestial crowd by Electro-evolution, should stand legs astride the sensor pads, upper body rigidly erect with spine straight, and - I cannot stress this enough - one arm outhrust in solidarity with a closed fist to symbolize the force of the Electrocardiothetic Army. 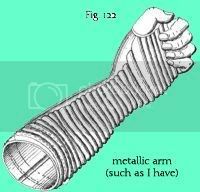 In fealty and obedience (but never thrall) to the DDR leader, the one with the metallic arm such as I have, the Revolutionaries should adorn their arms in chrome accents or strips of aluminum foil. Arms upthrust, the glow of the cathode screens thrown into scintillas by their metal arms, the Dance Dance Argonauts Revolutionaries will dazzle their enemies! Enemies include: mall security, the jerk who won't give free refills on your Orange Julius, friends' angry moms. And McDonald's shift managers. The Dance Dance cannon fodder Revolutionaries will dance, spin, jump, spin, and switch on their graves! Arise and jump around, fructose-fueled legions! Follow the path laid out by your Dance Dance Machines across the graveyard of our society!